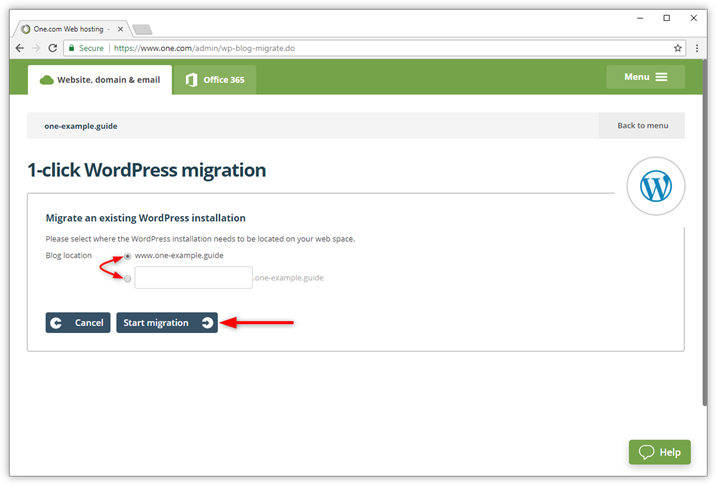 With WordPress 1-click migration you can move your existing WordPress site from one location to another. This is handy when you transfer your domain to One.com or change your domain name. Our migration tool can migrate sites of up to 1GB (max. 700 MB files + 300 MB database). 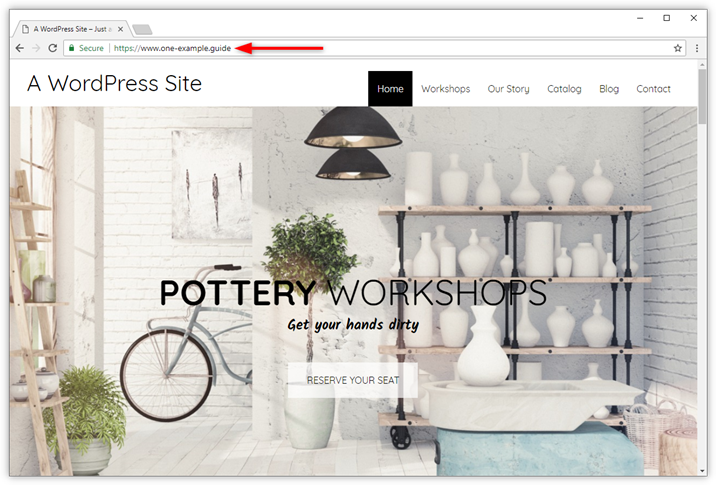 If your site is larger than this, you can probably reduce the size by cleaning it up with a plugin like WP-Optimize. During the migration you need to enter the following details. Please make sure you have these at hand, before you start the migration. 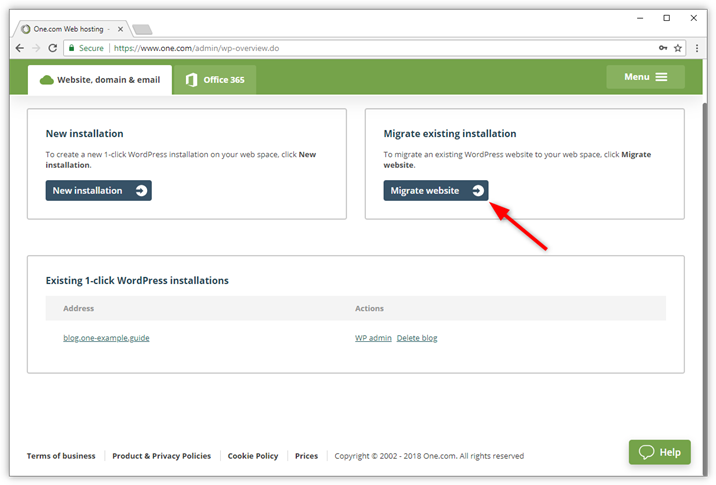 The URL where the WordPress site you want to migrate is located. Just open the site in your browser and copy the address. 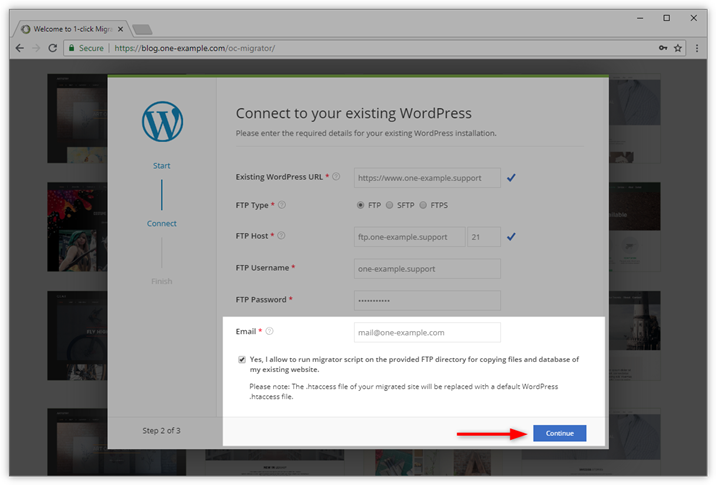 The FTP login details of the web space where the site you want to migrate is currently hosted. If your site is hosted with another provider, we need those details. Click Migrate website to start the process of moving an existing WordPress site to your web space. 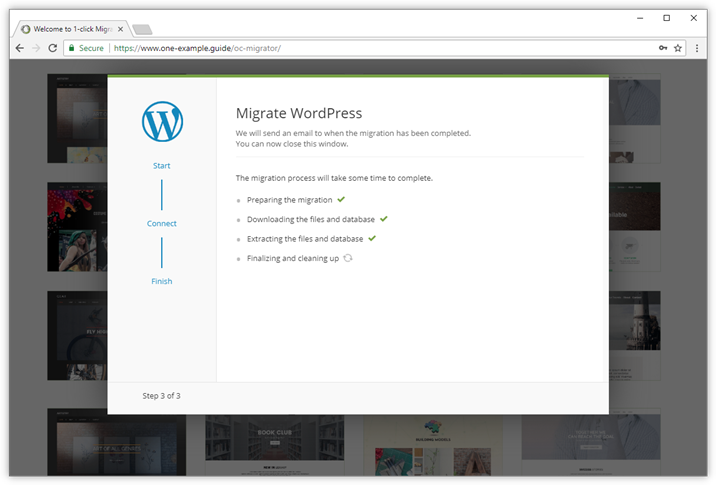 Note: If 1-click WordPress migration is not available on your package, you can upgrade for free for the duration of the current subscription period. 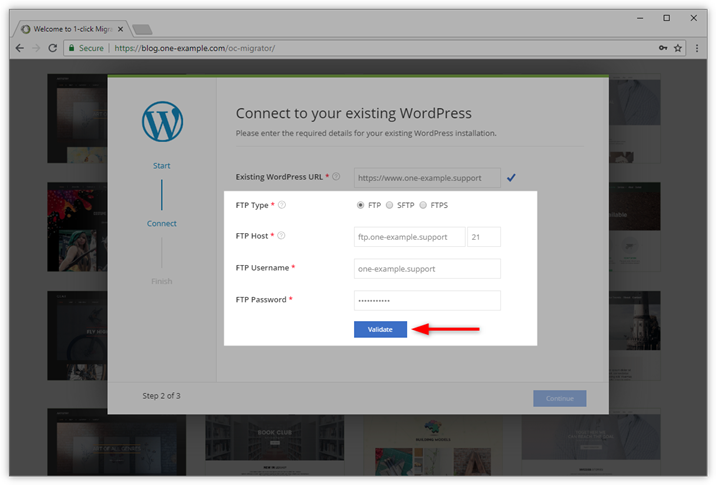 Choose the location for the WordPress installation on your web space. Enter the existing WordPress URL; it's the location where the WordPress site you want to migrate is currently available. To be able to migrate your site we need to log in to the web space where your site is currently hosted. Enter your FTP login details. 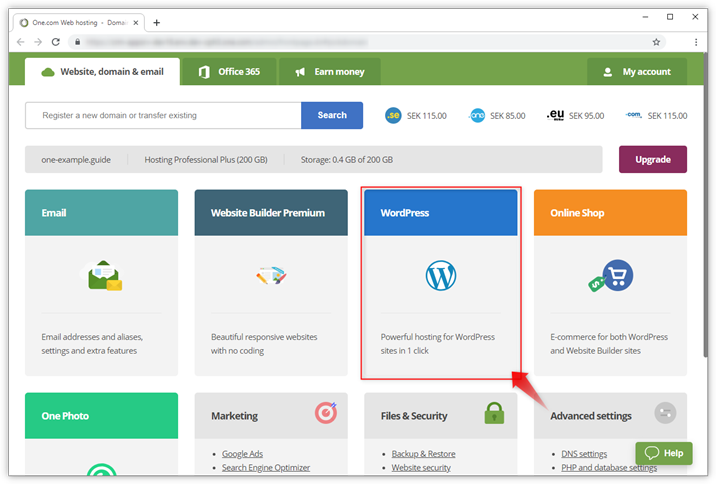 If you are not sure what details to enter, you need to contact the host where your WordPress site is currently hosted. This may not be One.com. Enter an email address; we will send a notification to this address once the migration has completed. Check the box to confirm that you allow us to run the migrator script. Note: The .htaccess file will be replaced with the default WordPress .htaccess. This is to avoid errors during the migration. 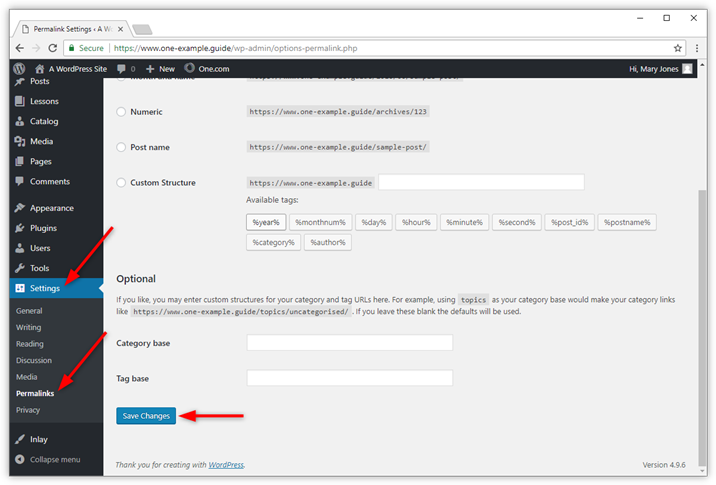 If you have added custom settings to your .htaccess you need to enter them again after the migration is completed. The migration is now in progress. Normally this should not take longer than 10 minutes. We will send you an email as soon as the migration has been completed, so you are welcome to close this window. 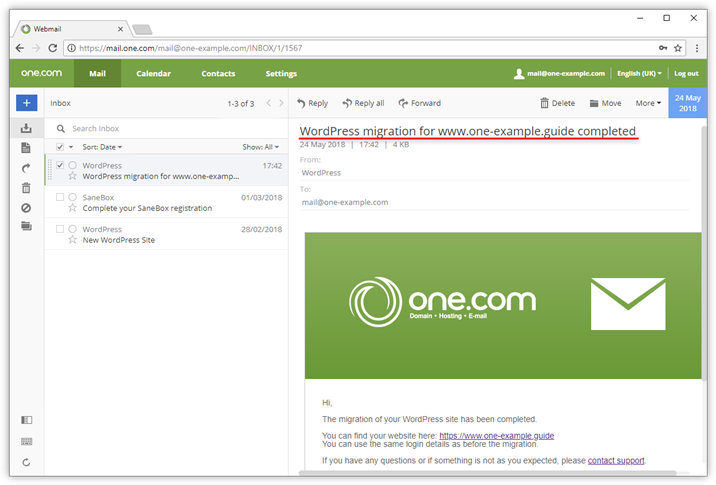 If something caused the migration to fail, we will also send you an email, in which we explain what went wrong. Also check our Migration troubleshoot guide. Tip: If the 1-click migration fails, you can always move your site manually. We have created a step-by-step guide to help you along the way. When the migration has completed we will send you a confirmation via email. Click the link in the email to open your migrated website and check if everything is as expected. If you experience that you get a 404 error when you try to open links on your site, the Permalinks are broken. Luckily it is very easy to fix this. If you experience that images don't show correctly, this means that the links are still referring to the old domain. You can fix this by reinserting images manually. When you have a website with a lot of images you can try a plugin called Better Search Replace. It automatically replaces your old domain with your new domain in your database. Note: Plugins are third party products and not something we can help you with. Please contact the maker of the plugin if you have any problems. We recommend you to make a backup of the files on your website and your database before making any changes. Search for Better Search Replace and install the plugin with that name. Click Activate to make the plugin active. Click Tools and Better Search Replace. Search for the old domain name and Replace with the new domain name. Select the tables that you want to search in. Your posts are located in the table wp_posts, but usually you can safely select all tables. 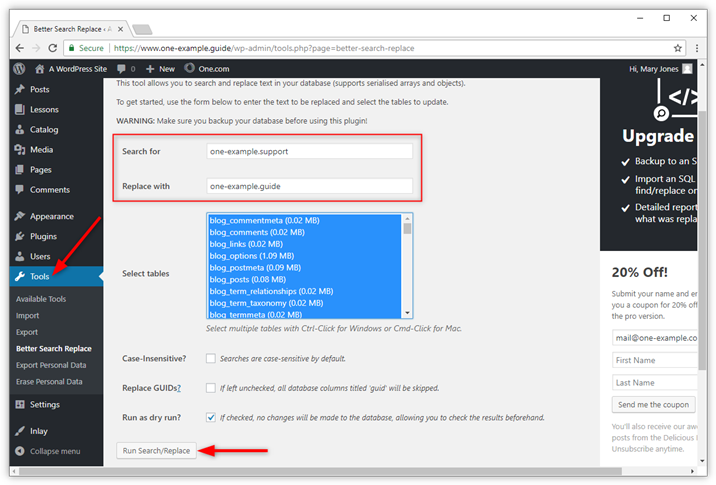 Uncheck the box for Run as dry and click Run Search/Replace. If you want to do a test run before making changes, leave the box for Run as dry checked. In most cases, your website is now successfully moved, including images and links. If you still encounter problems, we recommend you to check the WordPress codex for more help.